The CERN Foundation is delighted to announce that Kimberly Wallgren has become the President of the CERN Foundation. She has been involved with the Foundation since inception in 2007 as a member of the CERN Foundation’s Awareness and Outreach team. Mrs. Wallgren brings not only a breadth of professional experience to the CERN Foundation, but also a true passion born from her personal experience with ependymoma. 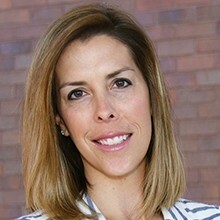 Kimberly Wallgren graduated from Virginia Polytechnic Institute and State University in 2003 with a Bachelor of Science in Marketing Management. During her college experience, her father whom she adores, was diagnosed with anaplastic ependymoma. This rare disease forever changed her entire family. She knew she wanted to help make a difference for those suffering with this disease because of the hardships her father faced as a patient as well as those her mother faced as a caregiver. After graduation, she went onto work in the field of pharmaceuticals and then neurosurgical devices where she had the chance to work with neurosurgical staff in hospitals across the country. After her father’s recurrence in 2006, she joined forces with the leadership of the Collaborative Ependymoma Research Network (CERN) Foundation to help create the Awareness and Outreach component in what she considered “an opportunity of a lifetime”. Kimberly is passionate about the individual experience of every person whose life has been changed by ependymoma. She believes building a community within a rare disease is critical in helping to spread awareness, impact outcomes, and support scientific research. She seeks to influence the unique experience by providing direction through personal communication at critical points of the journey with referral information and educational materials. She is also interested in helping to support collaboration between medical professionals and bridging the gaps between industry leaders and the patient/caregiver community. All of this stems from her deep love for family. Kimberly has been married to her husband Jake for twelve years and together they have four wonderful children. She is constantly humbled by her father’s survival in the midst of too many children and adults losing their life to the disease. Kimberly’s caring and compassionate personality, along with her willingness to try and understand patients and caregivers thoughts and needs makes her a perfect fit to take on the role as the CERN Foundation’s President. She is able to share a more personal and real perspective of this disease and its effect on a family with the providers of the CERN Foundation. Her greatest joy is being able to create a true connection with individuals whose lives have been affected by ependymoma.